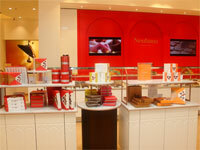 The Neuhaus shopwindow displays are designed in such a way that the customer has an instant overview of the shop's elegant and unique interior. But to draw the customer's attention towards the shop window, we display products within various price ranges, seasonal products, promotions, and wide selection of our chocolates. Being the premier chocolatier that invented praline, it is extremely important to emphasize Neuhaus' strong image by displaying the collections in the shop window. That is why we have to ensure that the window displays follow the same collections and communicate the same message everywhere. Our shops changes the window display about ten times a year and customer can expect new ideas, new designs for every collections for every occasion of the year. Each season's visual elements transform the store to create a sense of "newness" in customer's mind.